Rapper Bang Da Hitta, aka Keith Hayer, is being released from jail Friday. 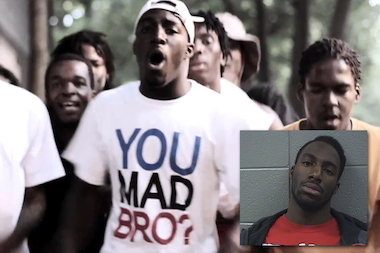 ROGERS PARK — Rogers Park rapper Bang Da Hitta, whose real name is Keith Hayer, was released from prison Friday. Hayer was arrested Feb. 9 after swallowing a crack rock during a traffic stop, according to court records. On March 24, he was convicted of felony resisting arrest and obstructing a police officer, and was sentenced to 30 months probation. But Hayer was back in court just a few weeks later, when he pleaded guilty to violating his probation. The probation was revoked on April 17, and Hayer was sentenced to one year in the Illinois Department of Corrections, court records show. He was credited with 48 days served from his time spent in Cook County Jail awaiting trial. On Friday morning, Hayer was released on parole, according to a spokeswoman with the Illinois Department of Corrections. Hayer gained notoriety in Rogers Park in 2013 when the then 22-year-old appeared in music videos that showed the local rapper and his friends toting guns, taking jabs at a rival street gang and calling for the death of their enemies. Hayer has been associated with a Morse Avenue faction of the Gangster Disciples known as the ICGs, or Insane Cutthroat Gangsters. The group has fatally fueded with the Howard-area GD faction Loyalty Over Cash (or LOCs). At least two of Hayer's friends who appeared in the 2013 video "In da field" alongside high-powered guns got locked up themselves for handling the firearms causing the video's producer to distance himself from the project. In January 2014, Hayer told DNAinfo that despite his violent lyrics, which have attracted the attention of police, he wishes death upon no one, except in the case of self-defense. "I'm not a killer, but don't push me," he wrote at the time. "If n----z gangbanging, death comes with it, bang bang ... it's war on these streets, and it's going to always be that way." In March 2014, Hayer was convicted of selling marijuana near Loyola Park and sentenced to 110 days in Cook County Jail, court records show. In September of that year, his car was set ablaze on Lunt Avenue in Rogers Park. In all, Hayer has racked up 19 separate Cook County convictions since 2009, including one felony case, according to court records. His charges range from retail theft and riding a bicycle on the sidewalk to reckless conduct, trespassing and assaulting police officers. Most of Hayer's sentences have required 1- to 60-day stays at Cook County Jail. His longest local sentence was 110 days for the March 2014 marijuana conviction, and he was sent to state prison once — for violating his probation in the crack-rock incident. The Cook County State's Attorney's Office on Friday wasn't able to clarify how Hayer violated probation. Hayer has said he only raps what he experiences, which has included the death of at least 16 friends, including the late-May murder of rapper Young Pappy (born Shaquon Thomas), another member of the ICG gang. Hayer has said of his music in the past that it is "all entertainment and hip-hop" and "poetry" that speaks to the ruthlessness he and others experience on the street. In 2010, Hayer himself was charged with attempted murder, aggravated battery and aggravated discharge of a firearm, court records show. He acknowledged he was arrested in connection to a Howard Street shooting. According to the arrest report, there was one victim. Hayer said he spent two years in jail, awaiting trial, before being found not guilty. Records show he was released from custody on Dec. 5, 2012. But as Hayer's legal troubles dragged on, the turbulent turf wars and violent music videos haven't slowed. The warring factions have left several innocent victims in their wake, including residents Wil Lewis and Markeyo Carr, who were both shot dead by gunmen aiming for Thomas. On May 29 of this year, Thomas was killed in the 4800 block of North Kenmore in Uptown. Only days later, on June 1, a 22-year-old man was shot and killed in LOC territory near Gale Elementary School by 17-year-old ICG member Germel Dossie after the victim supposedly made disparaging comments about the recently slain Thomas on Facebook. In July, rapper Lil Shawn, whose real name is Shawn Randall, allegedly shot and killed Vallan Francis, 22, in front of Francis' girlfriend and children in the 2000 block of West Arthur Avenue in West Ridge. At the time, Randall was on probation for a 2014 drug conviction. Randall has appeared beside Young Pappy in music videos. Cook County Judge Peggy Chiampas on July 21 ordered Randall held without bail, noting that the victim and his family "were in the process of gathering their belongings — and the three children who were there — to evade this defendant." If convicted, Randall could face a life sentence. Recently, another 22-year-old man was shot in the leg on Morse Avenue, part of ICG turf.